Some words that have been used to describe it by folks involved in the course layout are: Undulating, Serene, Unique, Breathtaking and Beautiful. The course will wind its way around the Whistler Valley, taking in a number of neighbourhoods and parks along the way. With a start line in the shadow of the Olympic cauldron, you will warm up in the exact location that Olympic and Paralympic athletes received their medals during the 2010 Winter Olympic and Paralympic Games. Upon departing Whistler Olympic Plaza the course follows municipal roadways into the neighbourhood of Whistler Cay, over Blueberry Hill, and along the shores of Alta Lake before entering a beautiful stand of temperate rainforest on the paved valley trail system. 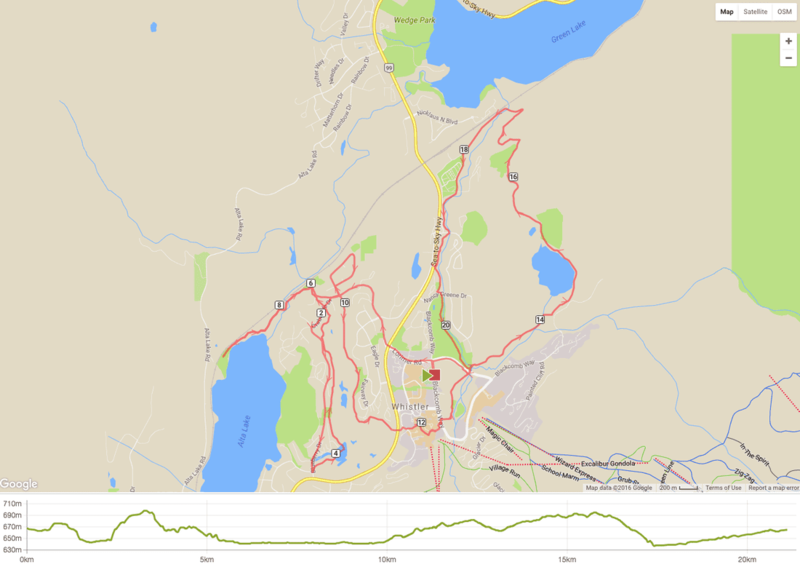 Following a loop through the Alta Vista area, the 1okm course splits off toward the village while the half marathon continues on the Valley Trail system out to what is arguably Whistler's greatest viewpoint at Rainbow Park prior to returning for a loop on "Easy Street". The peak of Whistler Mountain is in full view as the course returns to Whistler Village and a stretch along the famous Village Stroll. Departing Whistler Village the Trail connects the course to municipal roadways in one of Whistler's original neighbourhoods at White Gold, still home to some of the town's original ski cabins. The final stretch into the finish begins with a forested track offering peek - a - boo views of Fitzsimmons Creek, and Blackcomb Mountain; followed by a winding final kilometre into the finish line with views of the Olympic Rings and Paralympic Agitos framed by the iconic Peak to Peak gondola. The Half Marathon, with a total elevation gain of 250m, 4 hills, and plenty of flats; this course is achievable by athletes of all abilities. Negative split times can be expected with many of the hills being covered in the first half of the course. NOTE: This is NOT a closed course. Although the first few km are in desginated lanes on the roadway, please note that much of the course follows open roads and trail where vehicular (auto and bicycle), pedestrian, and animal traffic can be encountered at anytime. Aid Stations: Aid stations include water, Gatorade, washrooms, and first aid. Stations are located at the 4.5km, 9.5km, 12.5, 15.5km, and 18.5km distances in the half marathon and at the 4.5km and 8.25 km distances in the 10 km road run. Time cut-off: Please note that the course and finish line area will begin to be dismantled at noon. Should you plan to take longer than 4 hours to complete the course, you may find yourself without the aid of course marshals and traffic control. Please download a map and take it with you, once marshals and traffic control or removed the course, please proceed with caution using sidewalks and designated pathways. Please note: 2016 Sea to Sky Combo packages are ONLY on sale while space is available in both of the half marathon events. In the event that either event sells out, the combo package will no longer be available. You can register for both our events at one time, that way we get to see you in June and in October! Click Submit once the registration details are complete. If you are paying online now, please be sure to click the submit button for the registration form ​​before clicking on pay online, before clicking the Pay Online botton to the right. If you are paying online, click on the pay online button after submitting your registration form, you will be re-directed to our online store to pay for registration and have the option to make an additional donation to the food bank. The Crystal Lodge is offering all runners an early booking bonus! Book your room at our host hotel by February 28th, 2015 and stay 2 nights and receive a complimentary one category upgrade! Call reservations at: 1.800.667.3363 to book your room or click here for more information. Be sure to quote Whistler Half Marathon to get these rates. Book early to secure your room at the Crystal Lodge and Suites. Join Whistler coach and trainer Christine Suter and our team at the annual Whistler Food Bank 5k fun run. Registration is by donation on-site starting at 8:15am at the Whistler Golf Course parking lot, just off Whistler Way. Cash or non perishable food item(s) accepted. The 5k route follows the scenic valley trail in a counter-clockwise direction around the course. Fun for the whole family: kids, dogs, bikes and strollers are all allowed. See you there! Jess is a Montreal-based vegetarian runner and yogi, and one half of the health and fitness blog duo- http://tessandjess.wordpress.com. This will be Jess’ third season racing and her second racing in the half marathon distance. She is excited to be running the Whistler Half Marathon where she hopes to beat that elusive two hour mark. Will she do it? Check in on Tuesdays where she recounts her escapades in training through the land of poutine and the Montreal Canadiens. We should also mention that she’s originally from Toronto, so this may get messy. Join us Saturday October 27th at 9am for the annual Whistler Food Bank 5k run at the Whistler Golf Club. Oh yeah - there will also be some great door prizes!!! Who: Runners, Walkers, Parents with strollers, bikes, skateboards are all welcome!!!!! We need of a few good bloggers! Join us as a blogger and share your running stories with the world. Our blog will start up in early January and will be a place for our writers to share running stories, training sessions, and the trials and errors on the road to successful running. All chosen bloggers will receive an entry to the 2012 race in return for their efforts, plus a ticket to our carbo loading dinner on June 1st (along with the gratitude of inspiring people thorugh your experiences of course). *You can live anywhere - not just Whistler! Applications will be accepted until midnight Friday December 9th, 2011. Our blog is now up and running, you can access it by clicking on the "Blog" button in the top navigation bar above. Our bloggers for the 2012 season are: Patricia Sorensen, Hayley Winters, and Edward McCarthy and they have some great information and stories to tell so be sure to check out the blog! The Adventure Carbo Load Dinner combines the mouthwatering buffet of our regular Carbo Load Dinner described here , with the adventures of Wild Play's Monkido aerial tree course. Some of the elements of the tree course include zip lines, suspended bridges, scramble nets and swinging logs. Experience this all while being safely suspended tree to tree, up to 60 feet off the ground! The Monkido tree course is a physical and mental challenge that will prove to be the perfect way to round out your preperations for race day. Price includes dinner, aerial tree course adventure, transportation from/to Whistler Village, and all taxes and gratuities.